This winter has been a tough one. But for my mom, it's been especially hard. Between the cold and the snow, her world has been shrinking. The sidewalks are, well, forget about that, and the apartment is so small that exercise is hard to manage. Walking the hallways is seriously depressing. A year ago she was in PT at the local hospital which was amazing for strengthening. She accomplished so much there with a wonderful therapist. But besides being tough to get to, the parking was tricky, far-away and the actual distance to the department was unwalkable for her. And then when we got there, she invariably had to wait in a long line of in and out-patient wheelchairs. Some of those unfortunate folks were in such bad shape that it just made you want to cry. We would sometimes eat in the hospital coffee shop afterwards. Although the outings and sessions were all good for her muscles, it was often pretty crushing on the spirit. Mine included. This winter Mom asked her doctor for a prescription to return to PT so she could get out of the wheelchair again. But she asked me not to take her back to the old place. I looked around and happily found a new PT studio just opened right here in town, in our old building at the river! And la-dee-da! That puts it almost next door to her favorite restaurant. Dayboat. Where we can start early and eat a delicious prix fix lunch (sesame salmon) in a quiet and beautiful room. There's still time to stop by next door and visit with her shop friends at the elegant and serene Eileen Fisher Lab Store. And then actually walk (!) down the way to PT where she works out with Jim, her spunky, flirty new therapist. They already have a plan. because she intends to be on the dance floor at Maggie's wedding. And it's all so much better ... it just makes you want to cry. Behind the scenes here, I've hopped forward to the bunny season. I know it's been all about valentines on the blog, but quite awhile ago, I took on bunny-crafting for Amy's online magazine, Inspired Ideas. 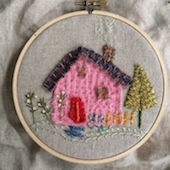 This is one of my two projects for her darling spring issue of the magazine. Have you subscribed? Hop over there and get in on the fabulous fun. So many lovely and sweet crafts for Spring. It's coming. Yes, it really and truly is! A few days ago I made some strawberry muffins as comfort food for friends. My market had some amazing berries this week. So delicious, I want to make them again. Strawberries are heart-shaped, just the right color for the valentine season and a healthier alternative to cookies and cupcakes. (But still love those!) These would be perfect for Valentine's Day breakfast on Monday as the family runs out the door to work. The trick to good muffins is stirring the batter just barely enough to get everything blended. Easy does it. Preheat oven to 375 degrees F (190 degrees C). Prepare an 8 cup muffin tin, or use paper liners. In a small bowl, combine oil, milk, egg and vanilla. Beat lightly. In a large bowl, mix flour, salt, baking powder, cinnamon and sugar. Toss in chopped strawberries and stir to coat with flour. Pour in milk mixture and stir together only to moisten. Don't over-mix. California and those warmer temperatures seem so long ago. Today I'm going outside in the 15 degree day to find some stretcher bars for my rolled up canvas from Solvang. I want to look at it. On the wall. All the time. Might help warm things up around here. Brrrrr. the spring issue of inspired ideas!